Giving proper quotations is not always an easy job to do. Especially in the photography business, where every little detail can affect the price. 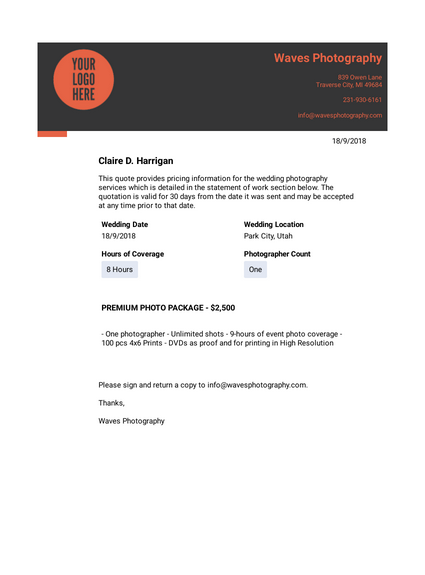 However, if you are a wedding photographer; with this Wedding Information Form PDF template, you can gather enough information to give an accurate wedding package quote to your customers. This form collects information like a number of photographers, coverage hours, customer's budget along with the additional comments section. After your customer submits this information to you, you can review their submissions and give them proper quotations with this nicely designed Wedding Information PDF template. This PDF document can be printed, or can also be sent online. It is totally up to your choice. This quote provides pricing information for the wedding photography services which is detailed in the statement of work section below. The quotation is valid for 30 days from the date it was sent and may be accepted at any time prior to that date. Online conference registration PDF template lets you collect attender general information, attendance and payment details and print as a well-designed document. All you need to do is to use this conference registration sample. Pull all data into the professional birthday party invitation PDF template and design your invitation to meet your specifications. Tailor your invite to match the look and feel of your event.